The Emerald Buddha sits serenely high up on a pedestal in the Temple of the Emerald Buddha or Wat Phra Kaeo within the grounds of the Grand Palace. Installed in the temple in 1784 when King Rama I established Bangkok as capital of Thailand, it's the holiest Buddha image in Thailand. The holy statue in the altar building or ubosot, where hundreds come to pray every day, has a history that dates to the 15th century. Way back in 1434, lightning hit a chedi in Chiang Rai, northern Thailand uncovering a plaster-covered Buddha statue. The plaster on the statue gradually flaked off revealing a Buddha statue of emerald green. The famous Emerald Buddha was discovered. On hearing the news, the King of Chiang Mai, who ruled the northern region, wanted the emerald statue in Chiang Mai. He sent an elephant to bring the Buddha to Chiang Mai. Strangely, each time the elephant reached the Chiang Mai-Lampang junction, it turned to Lampang instead. After three attempts, it was decided to let fate have its way. 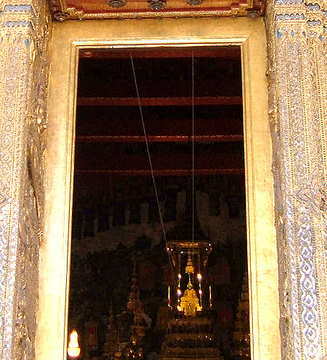 The Emerald Buddha was brought to Lampang where it remained for 32 years. It was only then that the new king finally succeeded in bringing the statue over to Chiang Mai. In 1551, the history of this precious relic took another turn. The King of Chiang Mai died without an heir to the throne. One of his daughters had married the King of Luang Prabang, in present day Laos. They had a son, Prince Chai Chetta. The Council of Ministers in Chiang Mai invited the young 15 year-old prince to be King of Chiang Mai. When his father died, King Chai Chetta returned to Luang Prabang with the Buddha and never returned again. The statue remained in Luang Prabang for 12 years. Under threat of Burmese invasion of Luang Prabang, the holy statue was moved to Vientiane where it remained for 214 years. In 1778, King Taksin of Thonburi attacked Vientiane then a rebellious vassal of Thailand. The general who led the attack on the city was Chao Phraya Chakri, who was later King Rama I, founder of the Chakri dynasty. When the city fell, the victorious Thai army entered Vientiane and discovered the Buddha, which was brought back to Thonburi in a long and arduous 600 km march. The army stopped at Saraburi on the banks of the Pasak River where it joins the Chao Phraya. On January 1779, a royal barge procession sailed up to Saraburi and brought the Buddha to Wat Arun or the Temple of Dawn near the palace of King Taksin on the Thonburi bank. In 1782 King Rama I decided to move the capital to Bangkok, build the Grand Palace and the temple to keep this holy relic. When the temple was completed in 1784, the Emerald Buddha was installed in its final home where it remains till this day. To visit Wat Phra Kaeo, take Chao Phraya river boat to N9 Chang Pier. 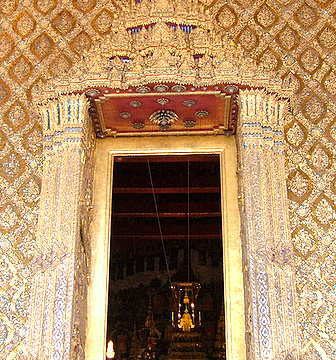 The temple is within the Grand Palace complex. To return to Rattanakosin and for more Bangkok Temples.